NEW ORLEANS, Louisiana, November 19, 2012 (ENS) – U.S. government agencies are investigating an explosion and fire in the Gulf of Mexico Friday aboard an oil production platform owned by Black Elk Energy. The incident left one worker dead, another is still missing and four others are in the hospital with severe burns. 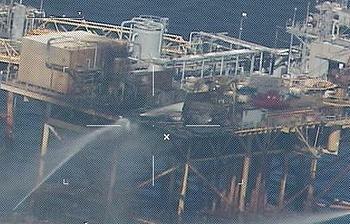 The U.S. Chemical Safety Board November 19 served Houston-based Black Elk Energy with a subpoena, seeking information about the explosion aboard the West Delta 32 platform, located in shallow water about 17 miles southeast of Grand Isle, Louisiana. The Department of the Interior’s Bureau of Safety and Environmental Enforcement began its investigation Friday morning. BSEE formed a seven-member investigation team shortly after the explosion that includes safety inspectors, engineers, safety management investigators, and law enforcement experts. The platform was not in operation and had been shut in since mid-August. The U.S. Coast Guard reported that the platform remains structurally sound but observed an oil sheen from the platform measuring a half-mile by 200 yards. Watchstanders at the 8th Coast Guard District in New Orleans received notification at 9 am Friday that there was a fire on board platform West Delta 32. The Coast Guard sent three planes, five helicopters and five vessels to rescue the crew and search for the missing in a 1,400 square-mile area around the platform. A total of 26 workers were on the platform Friday morning, a Coast Guard spokesman said. Four left the platform before the accident and 11 more after the fire broke out, he confirmed. First responders medevaced nine of the platform’s crew to nearby rigs. The body of crewmember Elroy Corporal, 42, was recovered on Saturday afternoon by a dive vessel under contract to Black Elk Energy. One crewmember remains missing. Late Saturday, the U.S. Coast Guard suspended its search and rescue efforts, but the company’s the search for the missing worker is still ongoing and will continue throughout the night tonight said John Hoffman, CEO of Black Elk Energy. “An official investigation continues and we will continue to cooperate with all authorities as this process develops,” said Hoffman who helicoptered to the platform Saturday to conduct a first-hand evaluation of the site with a team of safety and investigative personnel. Workers on the platform, which produces oil and natural gas, are contractors from a company in Louisiana and do not work for the company directly, Hoffman said. The dead worker and the missing worker as well as those hurt in the blast, are Filipino. Ambassador Jose L. Cuisia, Jr. of the Philippine Embassy in Washington arrived here this morning to look into the condition of four Filipino contract workers who are being treated for the serious burns they sustained in the explosion. Cuisia will monitor the search for the missing man and help the families of the injured. On Friday, a spokesperson with West Jefferson Medical Center, where the injured were first taken for treatment, said that the four workers had sustained second-degree and third-degree burns over much of their bodies. They were moved to Baton Rouge General’s Regional Burn Center for specialized treatment Friday afternoon. A burn center official told reporters Saturday that two workers remained in critical condition and two others are in serious but stable condition. At the time of the explosion, the workers were cutting a 75-foot long pipe that was three inches in diameter and contained as much as 75 gallons of product, Hoffman said. The process for cutting the pipe calls for a “cold-cutting device,” a tool that produces no spark, Hoffman said. But he acknowledged to reporters that a cutting torch was used instead, which ignited vapors in the pipe.